As soon as Day of the Moon, the second half of this series' two-part opening, finished, my gut reaction was one of giddy excitement. That's partly due to the final moments of the episode, which I'll discuss later, but mainly because of the fun involved in watching Matt Smith, Karen Gillan, Arthur Darvill, Alex Kingston and Mark Sheppard barrelling through a typically convoluted Steven Moffat story. I enjoyed the hell out of this episode of Doctor Who. But then, within about an hour, I felt my enthusiasm...not waning, exactly, but certainly dimming slightly as I tried to think what this episode was actually about. I've got the basics, I think; The Silence, the race of Edvard Munch-looking motherfuckers that were properly introduced in The Impossible Astronaut after being alluded to for all of last series, have the ability to edit themselves out of the memories of anyone who encounters them as soon as people break eye contact with them. Using this, they have been able to manipulate the development of humanity for millennia through a form of post-hypnotic suggestion. Since this power makes it almost impossible for The Doctor and co. to fight The Silence - how can you fight an enemy if you forget that they exist as soon as you stop looking at them? - they have taken to making marks on their skin as reminders that they have made contact. 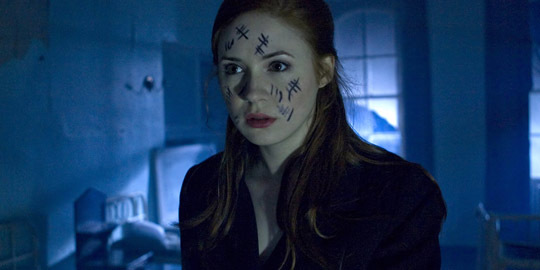 This image makes for two particularly striking moments in the episode; the pre-credits opening, in which Canton Delaware (Sheppard) appears to be chasing down and killing the various members of the cast, all of whom are covered with marks that make them seem like members of a cult; and towards the middle of the episode, when Amy walks into a room in an orphanage, sees her reflection in the window, and is instantly covered with the marks. One of the less commented on aspects of Moffat's work on Doctor Who, both before and after taking over as showrunner, is his knack for using incredibly lo-fi effects to create moments of eerie creepiness. Think of The Empty Child wandering around London in a gas mask and asking for his mummy, the hollow skulls in space suits of Silence in the Library or The Weeping Angels. They're all physical, practical effects that play on very primal fears that we carry from childhood. Though, in the case of The Silence, it may be playing on adult fears of losing your mind and memory, as evidenced by the caretaker of the creepy orphanage that Canton and Amy visit; he's spent so long being exposed to The Silence that he can't remember what year it is - he thinks it's 1967 when it's actually 1969 - and he repeats the same phrases over and over in a sad and confused manner. He even fails to understand the terrifying graffiti written all over the orphanage, which he thinks the (non-existent) children wrote when it's clearly a collection of warnings he (or some unknown other person) has written to warn others. I'm focusing a lot on that sequence in the orphanage, but it was a terrifically well-executed piece of horror that reminded me less of Doctor Who and more of The X-Files. The eventual moment of Amy discovering a room full of Silence who appear to be nesting on the ceiling was brilliantly scary, but the whole build-up of her and Canton working their way through the house, separating, then of Amy seeing a mysterious woman wearing an eye-patch who then disappears having led her into the room where she is trapped and kidnapped, was a wonderfully suspenseful sequence. Anyway, after the marks prove only semi-successful, The Doctor implants recording devices in the hands of everyone so that they can record any and all contact they have with The Silence. The devices, which glow whenever someone has left themselves a message, initially seemed like a fairly cheap re-appropriation of devices that Moffat has used in the past, but he managed to use them to great effect. Rory over-hearing Amy talking whilst she was being held by The Silence was very touching since it played into his protective feelings towards her and, when he thought she was saying that she was in love with The Doctor, it also revisited the rich vein of insecurity that made Rory and Amy's relationship such a strength in the last series. In a broader definition of the idea of recording devices, Moffat used them to make one of many great, sly jokes about Richard Nixon by having The Doctor be the one who tells him that he should have recording devices in The Oval Office at all times so they can track any encounters he has with The Silence. It's a funny, clever use of real history to support the plot that also realises the universal truth that Richard Nixon is the funniest President. The running joke that had The Doctor use Nixon as a get out of jail free card whenever he encountered military resistant was great, particularly the topper of having him stroll out of The Doctor's seemingly impenetrable prison. That was just one of the instances in which the episode used real historical events to advance its plot, none of which felt as clunky as the show sometimes can be. This culminated in the crux of the episode, in which The Doctor used The Silence's own nature against them by slipping in footage of one of them saying that humans should kill them all on sight into the live feed of the Moon landings, in doing so compelling the half a billion people watching it to subconsciously start hunting The Silence down. As I said, I found all of this fun, but in the end I wasn't really sure what it all meant. It's clear that Moffat is setting a lot of pieces in motion that should hopefully come to something by the end of the series, or hopefully at the end of this initial run of seven before the show takes a four-month break, but just throwing these things out there is not in and of itself satisfying. I don't want to pre-judge where the show is going because I like this kind of television, the kind that expects you to hang around for a little while to get the most out of it, but individual episodes need to feel complete and coherent, which Day of the Moon did, but only by the skin of its teeth. I'm also a little worried that Moffat is falling back on ideas and themes that he's already explored pretty fully. For example, it's nice to see that the show didn't just sweep their relationship under the rug when they got married, but Rory being afraid that he will have to share Amy with The Doctor is pretty well-worn territory. I know that it was all neatly wrapped up in the episode by having Rory realise that she was referring to his stupid face, not The Doctor's, but we don't want to get into a whole Team Doctor and Team Rory situation. You'd think that the whole "waiting 2000 years for her" thing would have been enough to get her on side. However, all of this is kind of overshadowed by the last scene of the episode, in which a dying girl appears to regenerate like a Time Lord. This revelation was hinted at in the week, the implication being that something was going to happen in the last moments of the episode which would make the Internet explode with fan reactions. Now that we are travelling through a The Road-style post-apocalyptic landscape where we must fight and die for tattered remnants of lolcats, we have to wonder what her significance is. I'm guessing that she's probably very significant, and it's a bold move for Moffat to tease such a major introduction so early on. The show has left a lot of questions, and I do want to find out some of the answers, but I hope that The Doctor has a few fun, slightly less head-fucky adventures before he gets down to the business of unravelling what the hell is going on. So, are there two mysterious girls or one mysterious girl? Is the one in the spacesuit the same as the one who regenerated at the end? I thought that they looked different, myself, so that begs the question of who they are. I thought last week that Amy's child - despite her claims to the contrary, I think it's pretty clear that she is either pregnant or has had the child, somehow, already - might grow up to be River Song, since it would be a nice twist on the idea that many people have suggested that River and Amy are the same person at different stages in their life. Now, I'm inclined to think that the new girl is Amy's child and, rather than being her and The Doctor's child, was created through some as yet unseen interaction with the TARDIS.